Meniere’s disease is a rather rare vestibular condition, but it is also one of the most debilitating vertigo diseases. If you or a loved one is battling with this condition, you need to learn everything that you can in order to combat it naturally. Today, we are going to take a closer look at the individual symptoms of Meniere’s disease. Then we will consider a natural therapy that has been able to help hundreds of Meniere’s patients in case studies to find long-term relief from the symptoms, especially the severe and debilitating vertigo. Hearing loss – One of the tests for Meniere’s disease is a hearing test to determine the amount of hearing loss that has taken place. In the early stages of the disease, hearing loss is limited to low tones and usually accompanies a flare-up of the condition. As Meniere’s progresses, the hearing loss may become permanent, and the upper range of tones can also be affected. Therefore, a hearing test is one of the best indicators of the stage of the disease. Tinnitus – Another symptom that progresses along with the disease is tinnitus. This is a ringing, buzzing, or rushing sound in the ear. 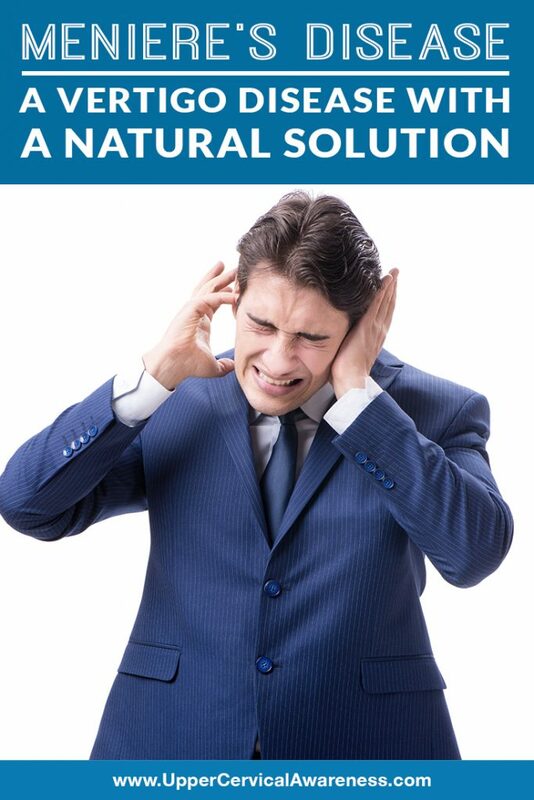 If you have ever been exposed to loud sounds for several hours, you probably experienced a mild form of tinnitus afterward. However, the tinnitus associated with Meniere’s is more severe and affects hearing significantly. Vertigo – This is one of the symptoms that is severe from the very beginning of the disease and is often what sends a person to the doctor in the first place. It is a false sensation of movement that can cause nausea and vomiting and may also lead to falls and injuries. While most cases of vertigo are brief (seconds to minutes), vertigo associated with Meniere’s is great in both severity and duration. Most bouts last a minimum of 20 minutes and can extend up to 24 hours. Pressure in the ear – Since Meniere’s usually only affects one ear, this refers to a feeling of fullness in the affected ear. Left untreated, far more cases of Meniere’s may become bilateral, so unilaterality, while common is not considered a symptom. The feeling of fullness is attributed to endolymphatic hydrops. Basically, this just means that there is an excess of the fluid that normally is in the inner ear. The excessive fluid can also be to blame for some of the other symptoms of the disease. It raises the question, why does the inner ear fail to drain properly? This was the question that led one upper cervical chiropractor to see if the answer might have something to do with the atlas (C1 vertebra). An upper cervical chiropractor realized that the position of the atlas could lead to problems with the eustachian tubes if it becomes misaligned. Since these tubes carry excess fluid away from the ears, the resulting problems could cause excess fluid in the ears and eventually the symptoms of Meniere’s disease. What did his case studies reveal? The first study involved 139 patients who had both Meniere’s disease and an upper cervical misalignment. Many of the patients had suffered injuries 10-15 years in the past for which they had clearly suffered whiplash but were never diagnosed. In the end, all but three of the patients saw astounding results, and those three patients had all dropped out of the study 6 weeks in. In the second study, the practitioner attempted to repeat the results but with a larger group of people over a longer period of time. In this study, 97% of the patients saw an average improvement of 90% in their vertigo and other symptoms. Could you find similar benefits by having an atlas misalignment corrected by an upper cervical chiropractor? The key factor for the patients in these studies is that they were all suffering from such a misalignment and had it gently corrected, so let’s discuss this natural form of care even further. What Is Upper Cervical Specific Chiropractic Care? Upper cervical specific chiropractic involves precise measurements of the top two bones in the neck. These bones affect everything from central nervous system function to ear function if they are not positioned properly. As a result, a subluxation can cause vertigo and the other symptoms of Meniere’s disease. How are these misalignments corrected? Once the precise measurements are taken, an adjustment can be mathematically calculated to move the vertebrae fractions of a millimeter. These adjustments are extremely gentle. There is none of the popping or twisting that you probably associate with general chiropractic. As a result, the adjustments are safe for patients of all ages and health levels. Plus, gentle corrections last longer once the soft tissue surrounding the spine is able to heal. This, in turn, gives the body even more time to heal and can allow patients to space out their appointments. If you are a Meniere’s disease patient and you are trying to avoid the risks of surgery or having injections in your ear, then we encourage you to give upper cervical chiropractic care a try first. This is a safe and natural therapy that has helped hundreds of patients in case studies, so it is definitely worth a try before subjecting yourself to an invasive Meniere’s disease treatment.